In my recent trip to California, one of my stops -- all but mandatory for a person with my background -- was the Computer History Museum in Mountain View, in the heart of Silicon Valley. Short version: The museum is very well done. Now that's a disk drive! Longer version: This museum has one heck of a collection. Hardware from throughout my education and (first) career is well represented. Keypunch machines and an IBM 360 mainframe. Chunks from the ILLIAC IV, an early massively parallel supercomputer (and due to its Defense funding at the height of the Vietnam War, a cause for massive demonstrations during my freshman year at the University of Illinois). One kilobit(!) memory chips. DEC minis. (I go back, IIRC, only to PDP-8s, but the museum also has a PDP-1.) Atari's Pong. A Cray-1. Lots more. Seriously cool. Not so cool? Print-on-demand guns. In the first week of template availability, "3-D gun schematics downloaded more than 100,000 times, developers say." Unless there are going to be background checks for buying 3-D printers ... well, I'll let the Onion have the last word on the subject. Sad as much as bad, "Ray Harryhausen, 92, Hollywood special effects master," has died. 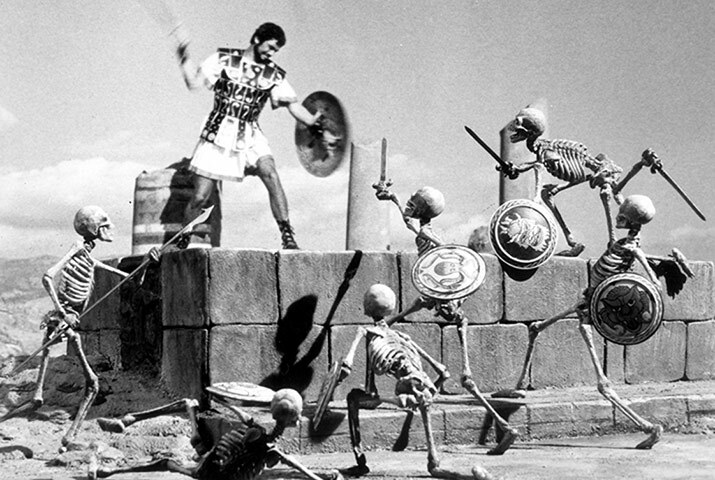 Jason and the Argonauts (first released in 1963) remains a treasured memory of my youth. I consider that movie to be Harryhausen's masterpiece. And carbon? Consider "Harrison H. Schmitt and William Happer: In Defense of Carbon Dioxide." Schmitt, of course, is a PhD geologist, Apollo astronaut, and former senator. Happer teaches physics at Princeton University and is a former director of the office of energy research at the U.S. Department of Energy. Not anti-science cranks. Of all of the world's chemical compounds, none has a worse reputation than carbon dioxide. Thanks to the single-minded demonization of this natural and essential atmospheric gas by advocates of government control of energy production, the conventional wisdom about carbon dioxide is that it is a dangerous pollutant. That's simply not the case. Contrary to what some would have us believe, increased carbon dioxide in the atmosphere will benefit the increasing population on the planet by increasing agricultural productivity. The cessation of observed global warming for the past decade or so has shown how exaggerated NASA's and most other computer predictions of human-caused warming have been—and how little correlation warming has with concentrations of atmospheric carbon dioxide. As many scientists have pointed out, variations in global temperature correlate much better with solar activity and with complicated cycles of the oceans and atmosphere. There isn't the slightest evidence that more carbon dioxide has caused more extreme weather. The current levels of carbon dioxide in the earth's atmosphere, approaching 400 parts per million, are low by the standards of geological and plant evolutionary history. Levels were 3,000 ppm, or more, until the Paleogene period (beginning about 65 million years ago). For most plants, and for the animals and humans that use them, more carbon dioxide, far from being a "pollutant" in need of reduction, would be a benefit. This is already widely recognized by operators of commercial greenhouses, who artificially increase the carbon dioxide levels to 1,000 ppm or more to improve the growth and quality of their plants. Food (heh) for thought. Read the whole thing.